The latest TouchWiz gallery app draws inspiration from Apple's iOS and HTC's Sense. The default view shows photos grouped based on time. Thumbnails are shown on a clean white background and you can change their size with a pinch zoom. Speaking of, the Gallery app can view your Picasa online folders but not Facebook. Samsung's TouchWiz music player was one of the most feature-rich apps, but the company has done some work to trim the fat. The app looks very clean now, essentially it has just two screens. The video player has been simplified too and the DLNA view is gone. You can still send video files to DLNA players or use screen mirroring. Alternative you can beam just the audio over Bluetooth, the Play audio only option is useful for music videos - playback continues, while you use the phone as normal. The video player supports all kinds of video file types and codecs, up to 4K 2160p encoded with the new H.265/HEVC codec. As usual multi-channel audio (AC-3, DTS) is not supported. Pop up mode puts the video in a small floating window so you can keep watching while using the phone. 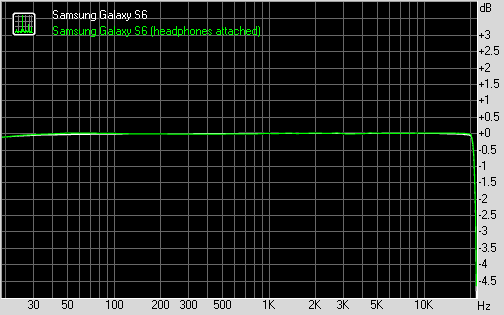 The Samsung Galaxy S6 audio output is easily among the cleanest we have seen a smartphone produce. Posting excellent scores top to bottom in the first part of our test, the Samsung flagship barely let its stereo crosstalk spike in the second one. In fact the stereo quality with headphones is the best in the class as you can see from the result table below. Overall this is some of the most accurate audio reproduction you can find on the market and one that should be good enough for even the most demanding audiophiles. On the other hand volume levels, while good, are not quite among the best we've encountered. The Samsung Galaxy S6 is still going to be loud enough for the majority of users, but the HTC lineup holds a lead in that department. Update, April 3: we retested the audio quality with a retail unit and we got the same numbers as the pre-release unit we used initially.